Stephen Harper is the first prime minister to have his own television crew. That’s not enough. He wants more than that wretched day-in-his-life documentary nobody watches. When a source told me the Conservatives would claim all news footage as fair game for their political attack ads, it seemed far-fetched, even for PMO control freaks. But my CTV colleagues got the documents to prove a blanket copyright exemption reserved only for political parties is coming forward. Of course, this won’t be a one-way campaign combat advantage. The NDP and Liberals can taste the counterattack possibilities as well. Glowing Harper tributes by disgraced senators Mike Duffy and Patrick Brazeau to their mentor Stephen Harper are now available to rivals. Harper’s derision of climate change, praise for the 2005 Iraq war debacle and that buy recommendation for stocks about to plunge in 2008 could be legally added to the advertising attack arsenal. But the intended or unintended impact of this proposal will be to cast a chill on every broadcast appearance in an era where scripted robots already dominate political discourse. 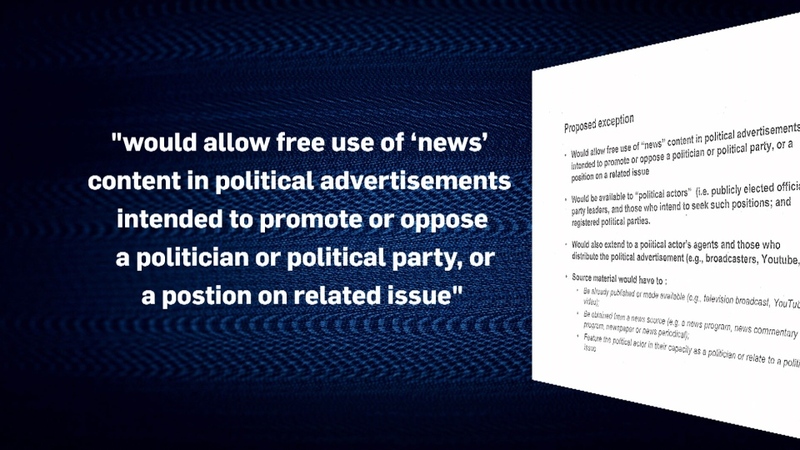 Every MP and indeed every commentator or even show host must now be aware their views could end up featured in a political attack ad. Context won’t matter. Words will be twisted into any narrative the campaign backroom boys aim to achieve. What’s worse, no matter how egregious the misuse of a network’s own footage, they cannot reject the unethical misuse of their own material. There are already legal loopholes allowing access to copyrighted material for research, education or satire purposes, provided the source gets credit. But this nefarious scheme goes much further. Only political parties will enjoy the full right to lift and warp material at will, backed by a guarantee it will be aired. Any government which asserts unlimited access to the airwaves for propaganda purposes is more than into chronic copyright infringement. In some academic opinion, that could be seen as flirting with fascism.